This week is another super fast DIY. Can you tell that I have had another hectic week? I’m trying to squeeze in too much. Xhosa lessons, jewellery lessons, my job, training for a race and trying to facilitate a potentially amazing project involving students and Public Open Spaces with local residents and our City Council. Early days but I’m sooo excited. The jewellery design thing happened by mistake. I was at a breakfast birthday and a friend of a friend was wearing – The – Most – Amazing – Faceted rose quartz and rose gold ring. Before I knew what happened I had the details of the studio and signed up. I will post some of my pieces in time but no way could I make stuff like that at home. A person needs a proper bench, tools, precious and semi-precious stones and metals. And lots and lots of skill. Our teacher does MOST of the work for me right now. I have quite some way to go. But it’s so much fun. This week I’m reverting the easiest DIY ever. It’s a piece of fabric, which is essentially a scarf. NO sewing required. Fabric options – limitless. Well almost. Denim and canvas. Nope. But think soft drapey type fabrics. Patterns can be fun too. I used a laser cut cotton knit in apple green. As you can see I got a nice big square-ish piece. I like big bold scarves. Love, love that nomad vibe. I feel a bit cheated with a wimpy scarf, unless I’m wearing it as a skinny scarf or a neck-tie. 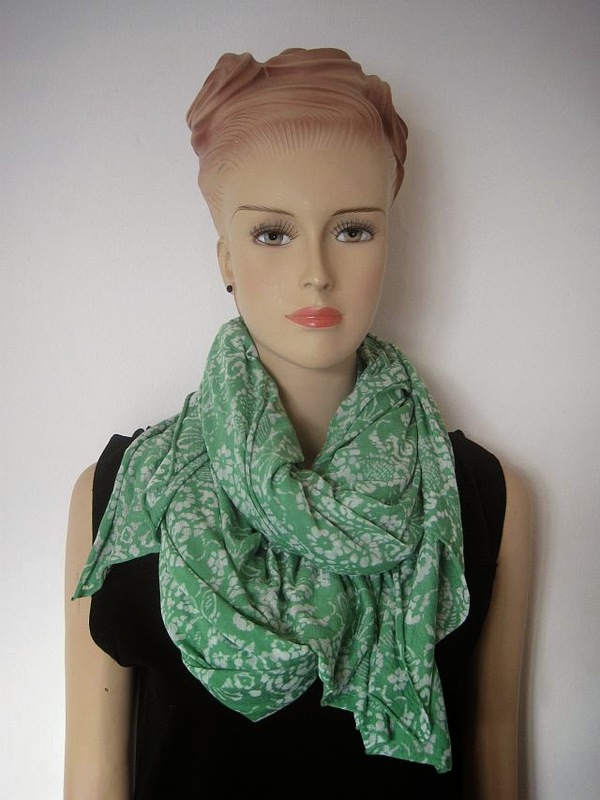 This scarf is great for summer to keep the sun off my neck and shoulders. Heard of a turkey neck? Equally warm in winter. If the edges are inclined to fray on your piece of fabric, then you may have to tease them a bit to create a fringe. No more than that required for a fun new scarf. See older scarf DIYs – here – and – here. And if you head back to the top of this page and find the Galleries, you will find 100’s of older ideas, FREE sewing patterns and all sorts of fun fashion things to make.